A new free initiative to get kids away from their screens and out into nature has been launched in collaboration with Timaru District Council. The WuHoo Timaru Botanic Gardens activity map is now available at venues throughout Timaru and offers a wealth of activities for kids and adults to do while exploring the gardens. The map is the first initiative from the under the brand WuHoo Timaru, which is aiming to offer free family friendly activities at Timaru’s iconic venues. The Botanic Garden maps have been printed with the support of the Timaru District Council. 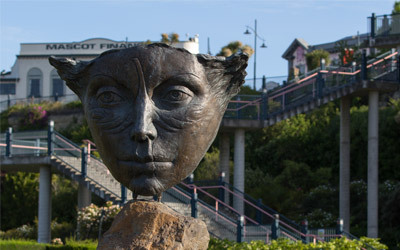 Roselyn Fauth, who has developed the concept with her husband Chris, said that the idea came as a follow on from the success of Timaru Rocks and the Timaru Sculpture Trail. “We spend a lot of time at the Gardens now that we have a young family, and were looking for new things to do while we were there,” she said. “We saw there were guides at other gardens around the country, or outdoor challenges and thought we could come up with one for Timaru. “There is a map which includes seven activities such as an eye spy challenge, scavenger hunt, botanic bucket List, code breaker and Bush Bingo. Timaru District Council Parks and Recreation Manager Bill Steans said that it was great for the Council to be able to support this kind of initiative. “Our botanic gardens were recently named as one of New Zealand’s Gardens of National Significance, and ideas such as this that bring a new generation to learn about what we have on display has to be congratulated,” said Bill. Timaru Botanic Gardens can be found at the corner of King and Queen Streets, Timaru. It is open to vehicles between 8am and dusk each day. The maps can be picked up at The Gardens Fernery, the Timaru Information Centre, Timaru Library, South Canterbury Museum and Aigantighe Art Gallery.